I have really been enjoying cooking and eating Korean food lately. I am totally smitten with the red pepper powder (gochugaru) and red pepper paste (gochujang), and Dak Galbi is one of my most favorite recipes of all time. Recently I decided to make my Dak Galbi even more authentic by adding Perilla leaves; however, they were 5 bunches for 99 cents at the Korean market, so I had a lot left over. Well, I had to find some new recipes in which to use the Perilla leaves, and Gamjatang was the answer. One of the great things about this recipe, besides the fact that it tastes so good, is I got to learn about a bunch of Korean ingredients that I had never used before. On this plate you can see the Perilla leaves on the upper right. They are about as big as my palm, with serrated edges, dark green and barely fuzzy. They are a member of the mint family, but if you didn’t know that, you would never guess it. They are mildly herbal, a little sweet like an apple, with just a whisper of mint. They grow on a bushy ground plant, which is sometimes grown as an ornamental. Also on this plate are the long Asian garlic chives, which are actually longer, but I trimmed them down a little. The leaves are flat and taste like a mixture of chives and garlic. They added a lovely flavor note to the soup. I found both the Perilla leaves and garlic chives at the Korean Market named Market World in Torrance. The flavoring sauce in the metal bowl is made up of minced garlic, gochugaru, gochujang, wine, fish sauce and another new ingredient, perilla seed powder (duelkkae garu). This sauce is a total flavor bomb. Get ready. 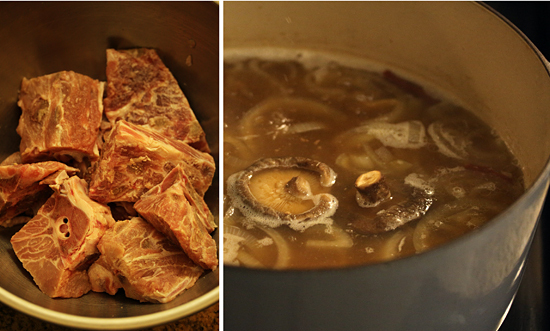 The recipe calls for pork neck bones, which I found at the Korean market in a cold case. They were packaged unfrozen in just the correct amount of pounds to make this soup. They were quite meaty and really cheap. $1.38 per pound. This photo shows the start of making the pork bone stock with water, ginger slices, onion, arbol chile, dried shiitake mushrooms and another new ingredient, Korean soybean paste called doenjang. The color of the liquid is that funky brown from the doenjang, but don’t turn up your nose yet, because the final dish is sooo good. Plus the flavoring sauce is going to turn the soup a mouth-watering red color. This is the hot pepper powder called gochugaru, which you can buy on Amazon or at Market World. 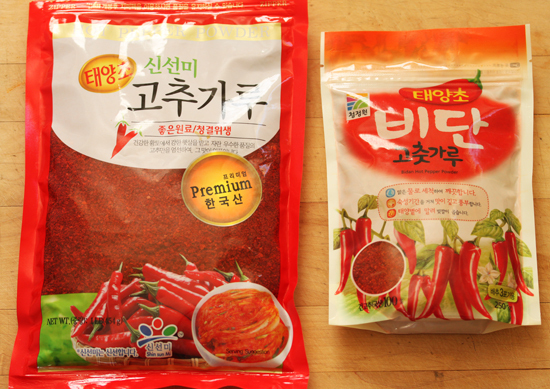 Gochujang is the Korean hot pepper paste made from fermented red chili, glutinous rice, fermented soybeans and salt. You can buy it on Amazon or at Market World. 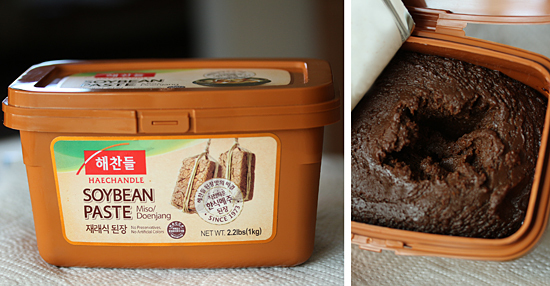 Doenjang is the Korean soy bean paste, which is similar to Japanese miso. Boiled stone ground dried soybeans are formed into blocks to ferment, then broken up in pieces and fermented in vats with brine. 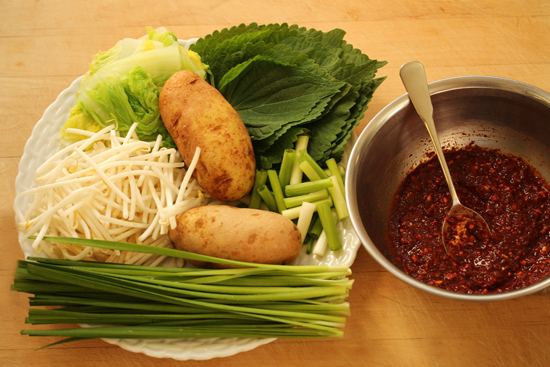 Liquid and solids are later separated and the liquid becomes Korean soy sauce and the solids are made into doenjang. Amazon or Market World. 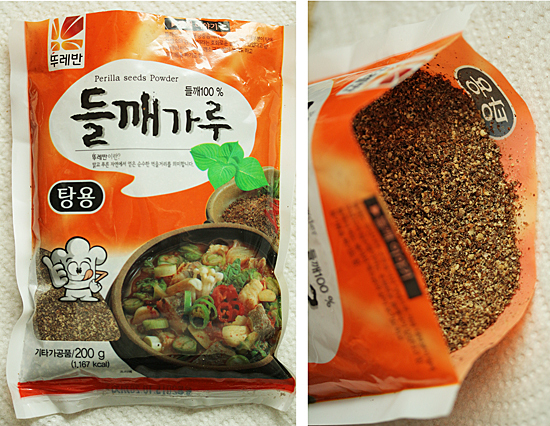 Duelkkae Garu is Korean perilla seed powder. Its flavor is nutty and a little sweet. I could not find any mail order source for you. So sorry. If you can’t find it at your Asian market, it can be optional. Your soup will be missing one flavor note, but it will still be amazing. When I was at Market World, I could not find duelkkae garu anywhere. I looked and looked. Finally, I did what I sometimes do when no store personal are in sight, I got a civilian to help me. In this case a Mom and her 11 year old son. Mom did not speak English, so she called over her son to help me. I had written down the Korean words, duelkkae garu, but he couldn’t translate that, so I tried to pronounce the Korean words. Mom and son said the words back and forth a couple of times, and the light bulb went off for the son. He said, “I know what that is, follow me!” I raced off after him with my cart, leaving Mom laughing in the aisle. Over two aisles, Son was kneeling, gesturing and pointing. And there it was on the aisle of ground seeds and beans. What a great kid. He was so happy to have helped me. I was so happy to have found this elusive ingredient. This soup was so much fun for me, you have no idea. All the new ingredients I learned about, plus a really delicious dish to eat. AND, I got to buy one of those really cool Korean stone bowls with its cover to eat my soup. This was a really great adventure! 1. Soak 2 ½ pounds of pork neck bones in cold water to cover by 2 inches) for 2 hours. 2. Boil water in large pot. Add napa cabbage to water and blanch for 1 minute. Rinse, drain and tear into large bite-sized pieces. Put on large plate and set aside. 3. Rinse pork neck bones in cold water. Place in boiling water to cover (about 7 cups) with 4-5 slices fresh ginger. Cook for 7 minutes. 4. Rinse and strain pork neck bones and put them in large pot or Dutch oven. Remove excess fat. Pour 10 cups water into pot. 5. Add sliced onion, sliced ginger, soy bean paste, dried red chili pepper, and dried shiitake mushrooms. Cook for 1 ½ to 2 hours over medium high heat until meat is very soft. Add cups of water periodically to replace evaporation. I added 5 cups of water total during cooking. Skim froth occasionally and at end of cooking. 6. 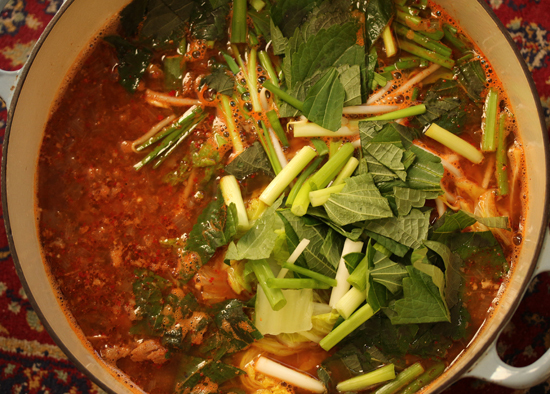 Make the sauce: In a medium bowl, mix together minced garlic, hot pepper flakes (gochugaru), hot pepper paste (gochujang), cooking wine, fish sauce, and perilla seed powder (deulkkae garu). 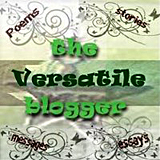 Cover and reserve. 7. While pork is simmering, Wash, dry and prepare vegetables. Place on large plate with cabbage. 8. 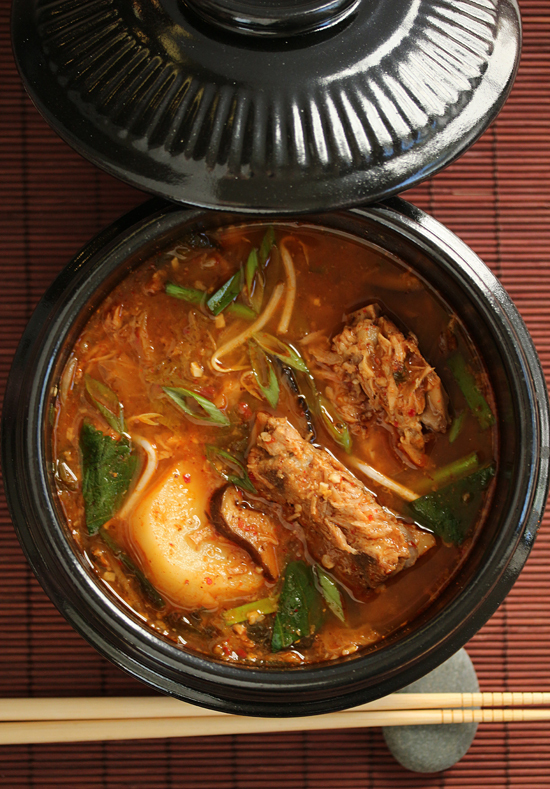 After pork has simmered for 1½ to 2 hours, remove red hot chili pepper, ginger slices and shiitake mushrooms from pot. Discard chili and ginger, and slice shiitakes into bite sized pieces. 9. Remove bones to a bowl and pour liquid into a sauce pan. Measure liquid in a large measuring cup, pouring back into Dutch oven. Add enough additional water to make 10 cups total. (I added 5 cups of water.) Return pork bones to liquid. Bring to a boil. 10. Add reserved sauce and mix into liquid. Add prepared vegetables and shiitake mushroom pieces to soup. Bring to a boil, then reduce to low heat to maintain simmer. Cook for additional 30 minutes, or until potatoes are done. Adjust seasoning. I added about 1 teaspoon additional kosher salt. 11. Serve in bowls garnished with sliced green onion, sliced perilla leaf, garlic chive pieces and ground black pepper. Each bowl receives 2 whole pork bones with meat attached and potato chunks. Note: Traditionally would be served with rice and kimchi on the side. Wow, what an exotic dish and great adventure! I love the story about the boy! Maybe you should start hanging out at that market for fun, and pretty soon you’ll be speaking Korean.